In GNSS-SDR, each configuration file defines a receiver. 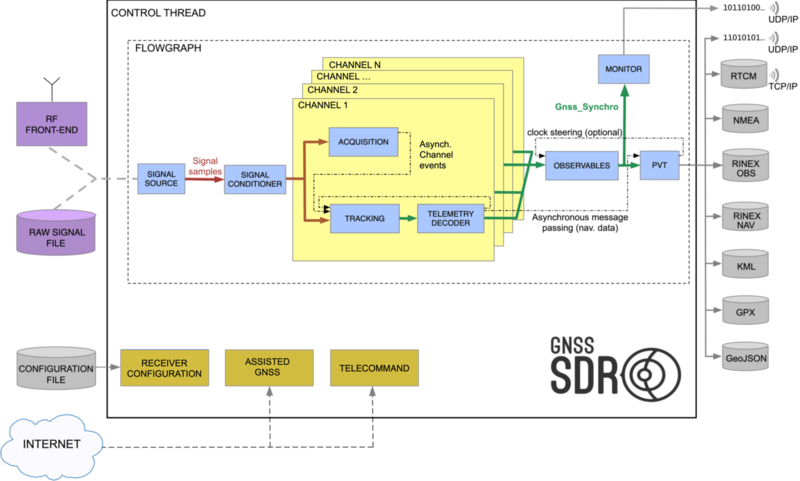 This page documents the available implementations for each of the GNSS processing blocks, represented as blue boxes in the figure below, and their parameters. Documentation of global receiver parameters: Sampling rate of the GNSS baseband engine, Telecommand and Assisted GNSS. Documentation for the Signal Source block. Documentation for the Signal Conditioner block. Documentation for the Data Type Adapter block. Documentation for the Input Filter block. Documentation for the Resampler block. Documentation for the Channel blocks. Documentation for the Acquisition blocks. Documentation for the Tracking blocks. Documentation for the Telemetry Decoder blocks. Documentation for the Observables block. Documentation for the PVT block. Documentation for the Monitor block.